One of the most enduring debates in social science concerns the role of religion in society. This is reflected by concerns about how post-Cold War international relations might be marked by a ‘clash of civilizations’, early 20th century concerns about the compatibility of Catholicism and liberal democracy, and contemporary concerns about the compatibility of Islam and western culture, which have almost certainly played a role in the rise of right-wing populist parties in many western countries. For economists, however, it is the relationship between religion and economic performance that is of prime concern, and arguments have been made both for and against different religions and their negative or positive contribution to comparative economic development. The most famous work on how religion might impact on economic growth came from Max Weber (1958), who argued for the idea of a ‘Protestant ethic’. Observing that the predominantly Protestant north of Europe was richer than the predominantly Catholic south, Weber hypothesised that this could be traced back to Protestantism’s promotion of the virtues of hard work and thrift. As a consequence, he believed, Protestants worked harder than their Catholic counterparts, and saved more – facilitating the rise of capitalism in Western Europe. The theory remains controversial till today, although it has recently been argued, using data from Prussia, that it was Luther’s idea that Christians should be able to read the Bible and the consequential impact on human capital accumulation, rather than a Protestant ethic as such, that was the real reason why Protestants performed better than Catholics in that particular setting (Becker and Woessmann 2009). Nevertheless, a religion or religious order promoting hard work and thrift could surely have an impact on economic development through cultural change, and our paper (Andersen et al. 2017) argues that such influence was indeed exerted by the Catholic Order of the Cistercians, which spread around Europe from the 11th century. The Order, an offshoot of the Benedictines, was established in 1098 in France with the aim of returning to a literal observance of the ‘rule of St. Benedict’. Unlike their Benedictine cousins, who had softened their observance over time, the Cistercians aimed to return to an austere life of hard manual labour and restraint from consumption. Thus, the values that Weber was to associate with Protestantism had in fact already been promulgated several centuries later. As a direct consequence of the austere life they promoted, Cistercian monasteries became rich and successful. Thus, a tribute to their contribution to the landscape was made by the famous poet William Wordsworth: “Where’er they rise, the sylvan waste retires, And aery harvests crown the fertile lea”. The Cistercians made important advances in breeding and agriculture, perhaps most important by consolidating their land in ‘granges’ rather than the typical unenclosed village holdings of the time. Moreover, monasteries also made significant use of water power for a range of industrial activities. Importantly for our work, their teachings and practices spread beyond the walls of the monastery both to so-called lay brothers, illiterate peasants who followed a less demanding form of Cistercian life and worked the land, and to other secular labourers they employed, as well as to settled communities that formed around the monasteries. Our analysis therefore begins with a simple theoretical model, which lays out how Cistercian values might have propagated from this initially small group of people ‘beyond the walls’. Prior to the fertility transition, the economic success they enjoyed translated into reproductive success. Parents passed on Cistercian values to their children, who also enjoyed higher economic and reproductive success. In this manner, Cistercian values would eventually come to dominate society. Our model suggests that this might plausibly have happened within the space of just five centuries, although small initial differences in the Cistercian influence would also have led to considerable local variation in cultural values. We empirically investigate the plausibility of this account using historical cross-county data for England, where we have information on the location of Cistercian monasteries (and other monastic orders) as well as regional population data. In a pre-industrial Malthusian setting, greater population density indicates greater productivity. Specifically, we find evidence that counties with a higher Cistercian influence experienced more rapid population growth during the period 1377-1801, long after the Dissolution of the Monasteries by King Henry VIII in the 16th century when all monasteries were closed and their land confiscated. We measure the Cistercian influence both along the extensive margin (Cistercian presence, i.e. whether a Cistercian monastery was present in a county) and along the intensive margin (Cistercian share, i.e. the ratio of Cistercian monasteries to all religious houses in a county). 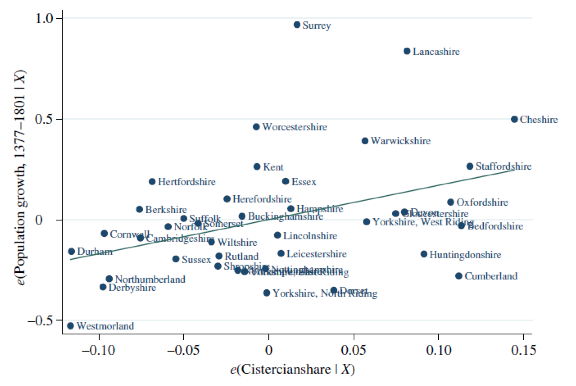 The partial correlation for the relationship between the Cistercian share and population growth is illustrated in Figure 1. Although we introduce a number of exogenous controls, we also use the work of historians to provide an instrument for the location of the Cistercian monasteries. It has been suggested that the Cistercians, who explicitly sought out secluded and isolated areas, often chose locations close to Royal Forests, which were places where the King enjoyed certain privileges, including hunting rights – which made them less desirable for other people. We find statistical evidence that this was indeed the case in the first stage of an IV, and this in turn reinforces our estimates of the effect of the Cistercian influence on population growth. In light of the likely persistence of cultural values, we use the European Values Surveys to zero in on the cultural mechanism. That is, we investigate whether or not the influence of the Cistercians can be detected in contemporary cultural values across European regions. As Protestants may also have been influenced by the Reformation, we concentrate on Catholic subsamples. Consistent with the cultural mechanism, we find that areas closer to Cistercians do place greater emphasis on values regarding the importance of ‘hard work’ and thrift across European Catholics. Our paper thus contributes to the literature on the potential positive effects religious teaching can have on economic growth. That the Cistercians, a Catholic order, had this effect does not at all detract from the point that Weber made, and in fact our analysis leads us to expect that Protestant teachings resulted in a similar process of growth through cultural change. Andersen, T B, J Bentzen, C Dalgaard, and P Sharp (2017), “Pre-Reformation Roots of the Protestant Ethic”, The Economic Journal 127: 1756–1793. Becker, S, and L Woessmann (2009), “Was Weber Wrong? A human capital theory of protestant economic history”, Quarterly Journal of Economics 124(2): 531–96. Weber, M (1958 ), The Protestant Ethic and the Spirit of Capitalism, New York: Charles Scribner’s Sons. Paul Sharp is professor of business and economics at the Historical Economics and Development Group, University of Southern Denmark.